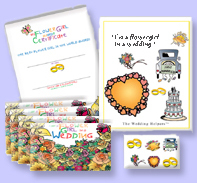 Created For "Children In The Wedding" by "Real Wedding Professionals & Child Educators!" 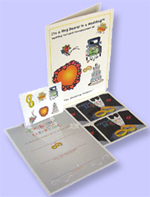 The wedding is a fun, yet, perfect learning experience for children... those in the wedding or attending! Adults have a great opportunity to teach their children about love, respect, family, the marriage commi™ent & other important life's values. Our "Children's Kits", for the Flower Girl, Ring Bearer, & Child/Children of the Bride or Groom, help educate as to the importance of a child's "special place" in the wedding day. The child is immediately involved from the beginning of the wedding planning, through announcing their role in the wedding to teachers, grandparents and others. Later, they brand "special" papers, drawings, notebooks, etc., with wedding related images and finally, proudly hang their " special certificate" in a place all their own! Each version includes 16 4-colour "themed" postcards-announces their role in the wedding- child send postcards to teachers, grandparents, friends, cousins, etc. Matching wedding stickers - To put on school notebook, drawings, or other treasures! 8 1.2 X 11 4 colour " themed" certificate (suitable for framing) - child collects signatures of bride & groom, even witnesses! Involve your child today, right from the moment they are asked to be in the wedding or you know that you are getting married. Teach them more about love, marriage & the honours associated with being "A Child In The Wedding !"